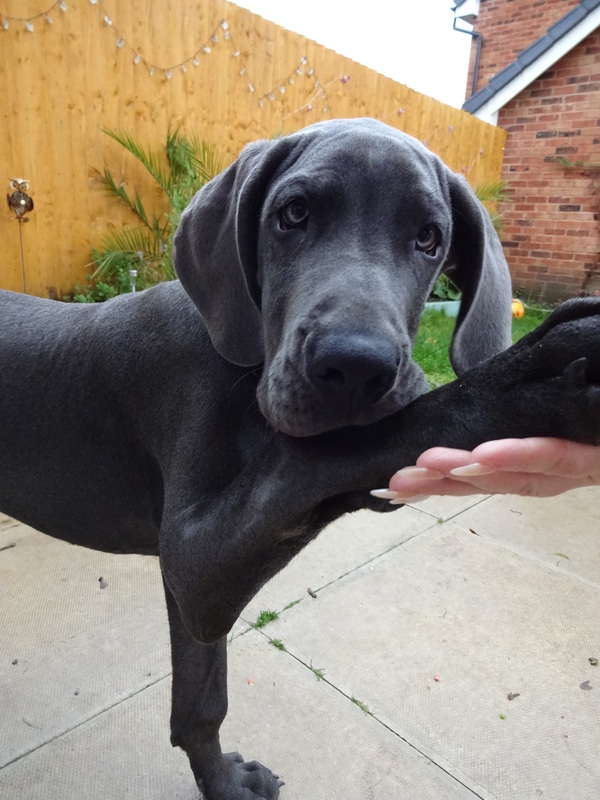 I’ve been very excited about today, I had arranged to go and meet Lottie a gorgeous Great Dane puppy! I met Lottie at the park a few weeks ago but I’d already found a dog that day so we arranged to meet up again. As soon as I arrived at Lottie’s house she gave me a very warm welcome, I gave her loads of strokes, she’s such a beautiful friendly girl. Lottie loves having cuddles and sitting on her humans knee having a fuss! She came and put her head on my knee a couple of times so I could give her a stroke! 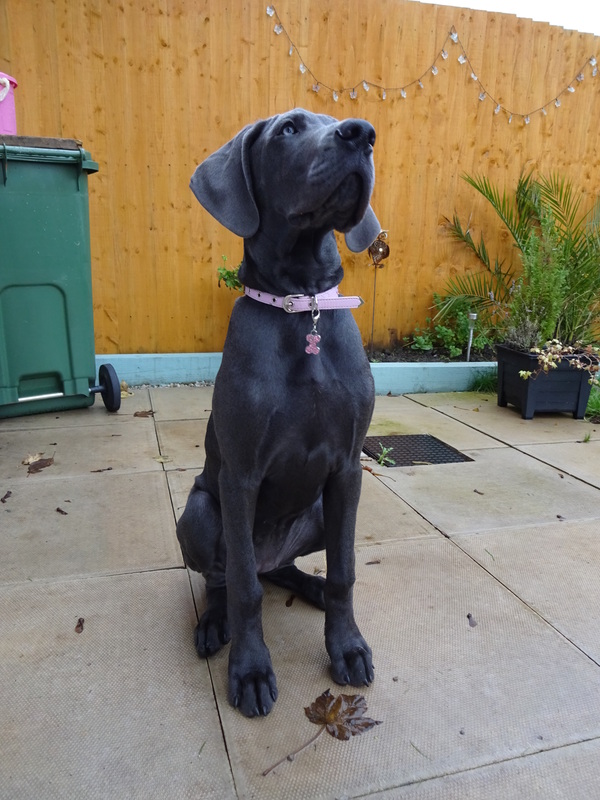 Lottie is only 18 weeks old but she’s already pretty big, although she still has her excess skin to grow into! Lottie’s human mummy told me that Lottie’s granddad is the biggest dog she’s every seen; maybe Lottie will grow that big! Lottie lives with 2 Siamese cats, Bow and Tye; she really likes them and sometimes tries to play with them but they’re not as keen! Lottie also has two human brothers. Look at that gorgeous face! Favourite toy: Squeaky pink bow! Favourite pastime: Cuddles, ruff and tumble and then a sleep! Lottie also enjoys her bath which she has once a week. © Liza Leonard and Year of the Dog Blog 2016. Unauthorized use and/or duplication of this material without express and written permission from this site’s author and/or owner is strictly prohibited. Excerpts and links may be used, provided that full and clear credit is given to Liza Leonard and Year of the Dog Blog with appropriate and specific direction to the original content. Bear is going to be massive! Year of the Dog: Brilliant dogs in the park!